Rei Amador was a member of the king of the Angolars and leader of a famous slave rebellion that took place in 1595 in the African islands of São Tomé and Príncipe. 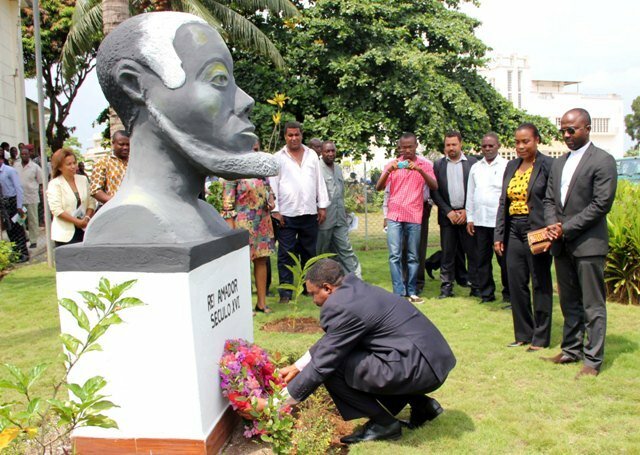 According to some historic documents, Rei Emadir was "a slave" who avoided slavery and mobilized all the Angolares along with other Africans and made a free nation under the middle of the mentioned islands. The Angolars inhabited the south of the island of São Tomé, there are different versions on the history. The first source on the Angolars, which were African slaves where brought from the mainland, probably from Angola who survived a shipwreck that happened about 2–3 miles (4 km.) in the south coast of São Tomé Island. Another version was that the Angolars were African slaves who had evaded their owners around 1470, when the Portuguese discovered the islands of São Tomé and Príncipe and have created their own free nation within the islands called Kilombo or Quilombo. The name Kilombo or Quilombo derives from (Kimbundo one of the most spoken Bantu languages in Angola), it can mean a settlement kingdom, population and union. Kilombo was an independent nation made by African slaves, who fought against slavery, once they fled, build their independent state with the system of slavery, The Kilombos, in general were localized in its regions densely forested, far from the plantations. A third version, was that the Angolars were Africans which were immigrated from the mainland to the islands of São Tomé and Príncipe, long before the arrivals of the Portuguese into the islands. However, the very particular remains inhistory of the Angolars and their reign in São Tomé and Príncipe are part of a history of self-determination and independence carried out by Rei Amador. On 9 July 1595, Rei Amador, and his people, the Angolars, allied with other enslaved Africans of its plantations, marched into the interior woods and battled against the Portuguese. It is said that day, Rei Amador and his followers raised a flag in front of the settlers and proclaimed Rei Amador as king of São Tomé and Príncipe, making himself as "Rei Amador, liberator of all the black people". Between 1595 and 1596, the island of São Tomé was ruled by the Angolars, under the command of Rei Amador. On 4 January 1596, he was captured, sent to prison and was later executed by the Portuguese. Still today, they remember him fondly and consider him a national hero of the islands. 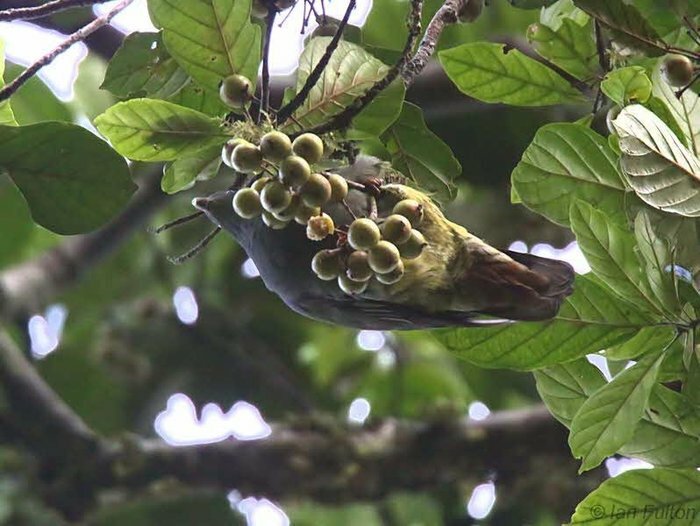 On foreground is The São Tomé oriole. 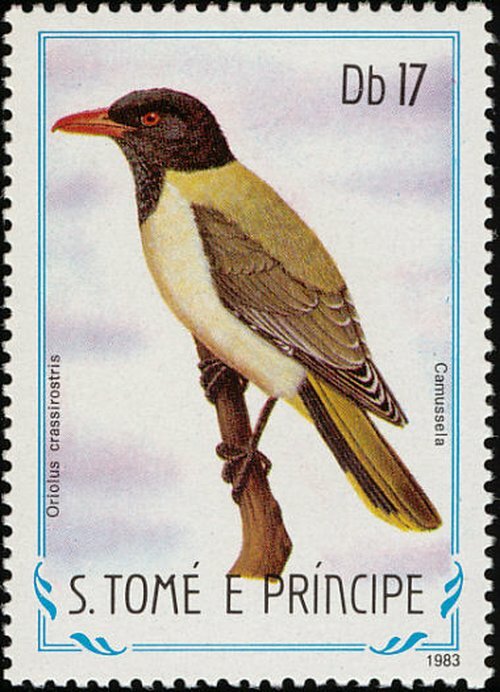 The São Tomé oriole (Oriolus crassirostris), or great-billed oriole, is a species of bird in the family Oriolidae. 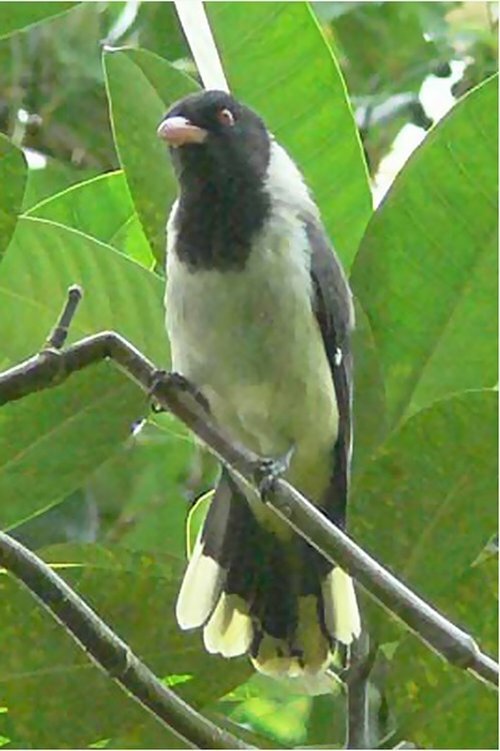 The species was named by Gustav Hartlaub in 1857. It is endemic to the island of São Tomé. Its natural habitats are subtropical or tropical moist lowland forests and subtropical or tropical moist montane forests. It is threatened by habitat loss. It is widely distributed throughout the island of São Tomé, except the northeast (the urban area of São Tomé). It is most abundant in the southwest and on the central massif. 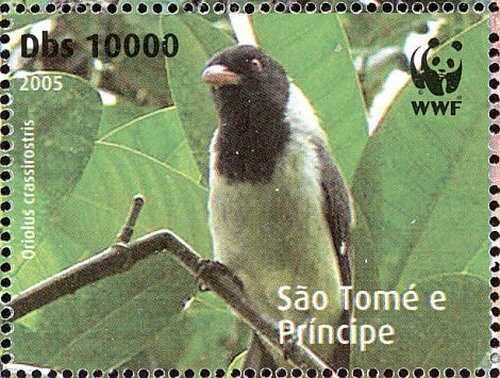 The São Tomé oriole is threatened by habitat loss of the remaining lowland rainforest of São Tomé. On background is Coffea arabica tree. 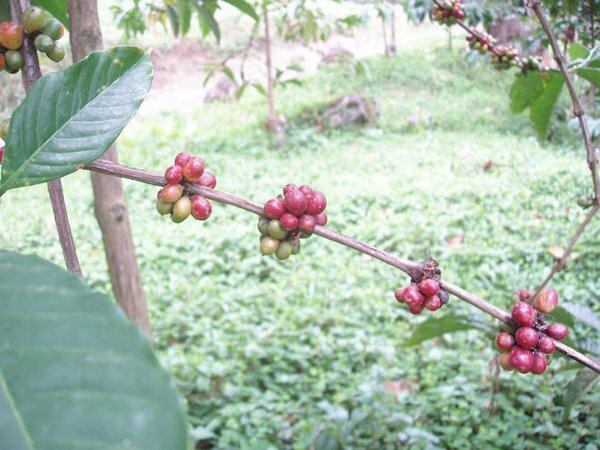 Coffea is a genus of flowering plants in the family Rubiaceae. 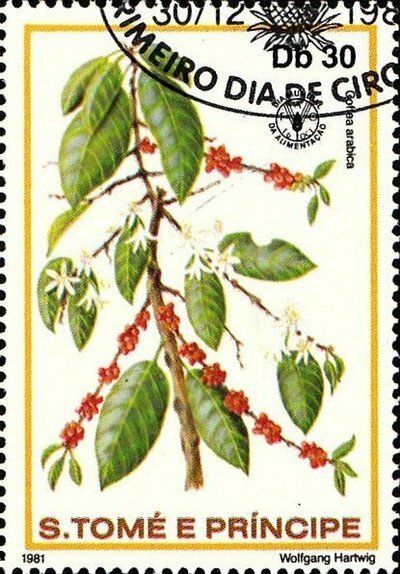 Coffea species are shrubs or small trees native to tropical and southern Africa and tropical Asia. The seeds of some species, called coffee beans, are used to flavor various beverages and products. The fruits, like the seeds, contain a large amount of caffeine, and have a distinct sweet taste and are often juiced. The plant ranks as one of the world's most valuable and widely traded commodity crops and is an important export product of several countries, including those in Central and South America, the Caribbean and Africa. Centered, above is the coat of arms. 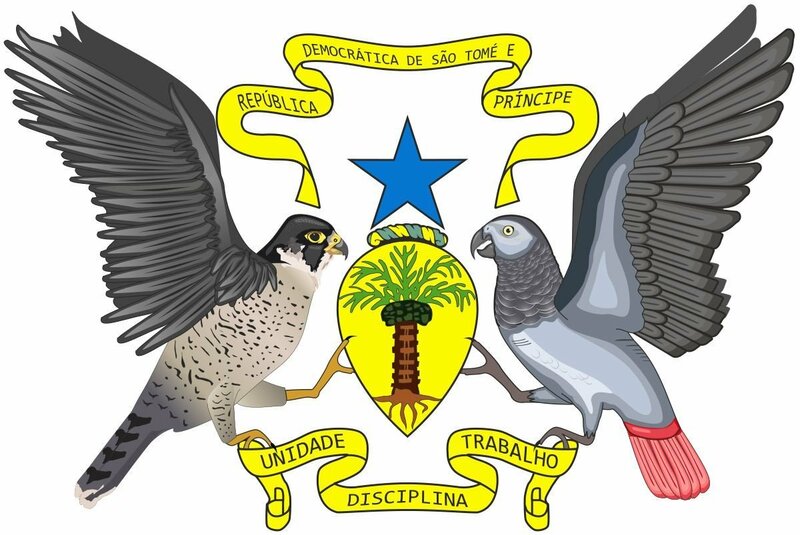 The coat of arms of São Tomé and Príncipe consists of a red-footed falcon on the left and a grey parrot on the right holding a coat of arms with a palm in its center. The coat of arms is surmounted by a blue star. Above, there is a band that states the name of the country. At the base of the arms the national motto, "Unity, discipline, work" is inscribed. Santo António (Portuguese for Saint Anthony), also known as Santo António do Príncipe, is the main settlement of the island of Príncipe in São Tomé and Príncipe. It lies on the north east coast. It is the capital of the Autonomous Region of Príncipe. The town is known for its colonial architecture and for its churches: Church of Our Lady of the Conception and Church of Our Lady of the Rosary. The town is also known for the Auto das Floripes play, which is performed by the citizens. The town Santo António was founded in 1502, and was a center of sugarcane cultivation. In 1695, the Fort of Ponta da Mina was built at the entrance of the bay of Santo António. Town and fortress were destroyed by French privateers in 1706. From 1753 until 1852, it was the colonial capital of Portuguese São Tomé and Príncipe. Santo António has a tropical savanna climate, with little temperature variation year round. The average temperature is 24.8 degrees Celsius. The average annual precipitation is 1872 mm., with the least precipitation in July and the most in October.